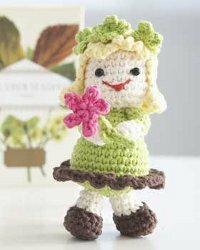 You know spring is finally here when you see this cute amigurumi doll, it's Mother Nature dressed up in her green outfit holding a flower. This is an easy crochet pattern from Lily Sugar n' Cream that will brighten anyone's day. Size 3.5 mm (U.S. E or 4) crochet hook or size needed to obtain gauge. Small amount of red yarn for embroidery of mouth. Stuffing. 2 small black beads for eyes. 16 sc and 20 rows = 4 ins [10 cm]. 4th rnd: Ch 1. 1 sc in each sc around. Join with sl st to first sc. Rep last rnd 7 times more. Next rnd: *1 sc in next sc. Draw up a loop in each of next 2 sts. Yoh and draw through all loops on hook – Sc2tog made. Rep from * around. Join with sl st to first sc. 16 sts. Stuff Head. Next rnd: Ch 1. *Sc2tog. Rep from * around. Join with sl st to first st. 8 sc. Fasten off leaving a long end. Draw end tightly through rem sts. With B, ch 12. Join with sl st to first ch. 2nd rnd: Ch 1. *1 sc in next sc. 2 sc in next sc. Rep from * around. Join with sl st to first sc. 18 sc. 4th rnd: Ch 1. *1 sc in each of next 2 sc. 2 sc in next sc. Rep from * around. Join with sl st to first sc. 24 sc. 6th rnd: Ch 1. *1 sc in each of next 3 sc. 2 sc in next sc. Rep from * around. Join with sl st to first sc. 30 sc. 7th to 10th rnds: As 3rd rnd. Join C at end of 10th rnd. Do not break B. 11th rnd: With C, working in front loops only, ch 3 (counts as dc). 1 dc in same sp as last sl st. *2 dc in next sc. Rep from * around. Join with sl st to top of ch 3. 12th rnd: With B, working in unused loops of rnd before last, ch 1. 1 sc in each sc around. Join with sl st to first sc. 30 sc. 13th rnd: Ch 1. *1 sc in next sc. Sc2tog. Rep from * around. Join with sl st to first sc. 20 sts. Stuff Body. 14th rnd: Ch 1. *Sc2tog. Rep from * around. Join with sl st to first st. 10 sts. 15th rnd: As 14th rnd. 5 sts. Fasten off, leaving a long end. Draw end tightly through rem sts. With D, work from ** to ** as given for Head. Next rnd: Ch 1. 1 sc in each of next 17 sc. (Sl st. Ch 5. Sl st) in each of next 7 sc. Join with sl st to first sc. Next row: Ch 1. 1 sc in each of next 17 sc. Turn. Leave rem sts unworked. Next row: Ch 1. 1 sc in each sc to end of row. Turn. Rep last row 4 times more. Next row: Ch 3 (counts as dc). 2 dc in first sc. *Sl st in next sc. 3 dc in next sc. Rep from * to end of row. With B, ch 5. (Sl st. Ch 5) 3 times in 5th ch from hook. Sl st in same sp. *Ch 10. (Sl st. Ch 5) 3 times in 5th ch from hook. Sl st in same sp. Rep from * 3 times more. Ch 5. Fasten off. Sew ends of Garland tog. Sew into place on top of Hair. Sew Hair onto top of Head. 3rd rnd: As 2nd rnd. Join B with sl st to first sc. 4th rnd: With B, as 2nd rnd. Rep last rnd 5 times more. Fasten off. Shoe: With C, ch 5. 1st rnd: 1 sc in 2nd ch from hook. 1 sc in each of next 2 ch. 3 sc in last ch. Do not turn. Working in rem loops of foundation ch, 1 sc in each of next 2 ch. 2 sc in last ch. Join with sl st to first sc. 10 sc. 2nd rnd: Ch 1. 2 sc in first sc. 1 sc in each of next 2 sc. 2 sc in each of next 3 sc. 1 sc in each of next 2 sc. 2 sc in each of last 2 sc. Join with sl st to first sc. 16 sc. 3rd rnd: Ch 1. Working in back loops only, 1 sc in each sc around. Join with sl st to first sc. 4th rnd: Ch 1. 1 sc in each of next 4 sc. (Sc2tog) 3 times. 1 sc in each of next 4 sc. Sc2tog. Join A with sl st to first sc. 12 sts. 6th rnd: With A, ch 1. Working in back loops only, 1 sc in each of next 3 sc. (Sc2tog) 3 times. 1 sc in next sc. Sc2tog. Join with sl st to first sc. 8 sts. Rep last rnd once more. Fasten off. Stem: With B, ch 9. Sl st in 2nd ch from hook. Sl st in each of next 2 chs. Ch 6. Sl st in same sp as last sl st.
Sl st in each ch to end of ch. Fasten off. Flower: With E, *Ch 6. Sl st in 6th ch from hook. Rep from * 4 times more. Fasten off. Stuff Arms and Legs lightly. With red yarn, embroider mouth. Attach beads for eyes. Attach Arms to either side of Body and sew Flower to Hands as shown in picture. Sew Legs to Body as shown in picture. This little doll is so cute, I love the little flowers on top of her head, and it looks like a little headband. The little ruffle around the bottom of the skirt with her carrying a flower just sends it over the top to adorableness. I think this is just the right size for a little one to carry around with them, not to heavy and soft enough to cuddy with. Just love it! Pretty!!!! The doll is cute! probly a typo.... just figure it out, its only one round, either copy the round before or leave it out.. not a big deal really. how in the heck do u read the instructions? This doll is so cute!!! oh she so cute I have to make one for my best friend! Where are the instructions for LEGS, 5th rnd? HELP, please! I started making this doll and got to legs and it skips from round 4 to round 6. Is this right and you need 1 more round or a typo? Round 4 is 12 stitches and round 6 is 8 stitches, so round 5 must reduce by 2 stitches. I would Sc2tog 2 times at the same place in the round that you did for round 4 and will do for round 6. Each time you Sc2tog you decrease by one stitch, so doing it twice will decrease by the 2 you need. I searched for this pattern at several sites, but could not find it. You probably have to contact Lily. The dolls I found were much larger than this one, but the method was the same. There were just a few more stitches in the round and more rounds to make a little bit longer legs.